Together with my co-workers, I developed computational methods in the field of vibrational spectroscopy, in particular for the prediction of bulk phase infrared, Raman, vibrational circular dichroism (VCD), and Raman optical activity (ROA) spectra from ab initio molecular dynamics (AIMD) simulations. We were the first to predict the ROA spectrum of a bulk phase system in 2017 (see article). 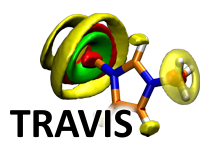 I am interested in investigating the fascinating properties of ionic liquids, in particular their hydrogen bond network and their unique solubility properties.